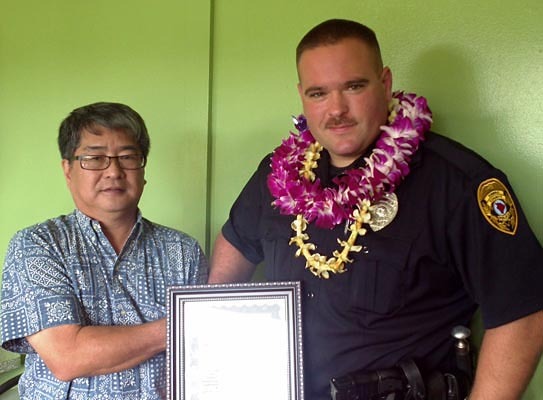 The Aloha Exchange Club of East Hawaiʻi recognized Officer Michael Santos on Thursday (October 27) as “Officer of the Month” for October. 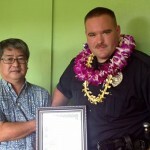 Santos, a patrol officer in the South Hilo District, was honored for for his outstanding work in arresting a wanted convicted felon for two no-bail probation violation warrants and several felony offenses. 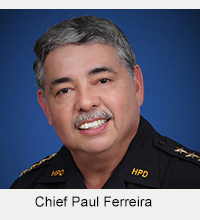 The incident began with a report of a suspicious vehicle parked along Kaiwiki Road in Hilo on August 12. Police investigation revealed that the man in the driver’s seat was a convicted felon wanted on two no-bail warrants for violating probation. When the man exited the car to be arrested, a glass smoking pipe was visible on the driver’s side floor. After obtaining a search warrant, Santos recovered the pipe—which tested positive for crystal meth residue—and a .22 caliber rifle with a sawed-off barrel, laser light and scope. 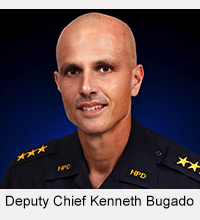 Santos also recovered an ammunition magazine loaded with 24 .22 caliber bullets. In addition to the two counts of violating probation, the suspect was charged with five felonies and a misdemeanor.